Yuba Village is always actively welcoming new participants. Yuba Village practices an organizational structure and decision-making process called Sociocracy. This practice involves the people affected by a decision in the forming of this decision, aims to make sure everyone’s voice is heard, and distributes power throughout an organization. We are learning how it works and will apply the principles as we go. 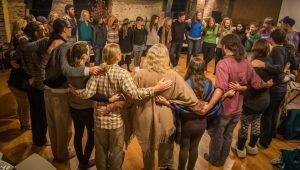 Joining a work circle is the most direct way to be involved, but we are thrilled to have you involved however you feel most compelled!